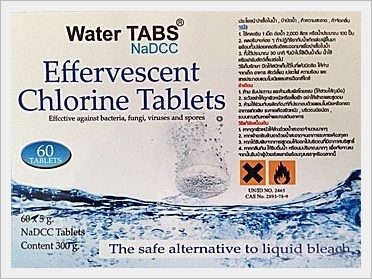 DCCNa Effervescent Chlorine Tablets, based on a dry chlorine donor, sodium dichloroisocyanurate anhydrous (DCCNa) which is blended with effervescent components before being compressed into tablet form. The result is a fast-dissolving, highly convenient, safer and more accurate alternative to liquid bleach. 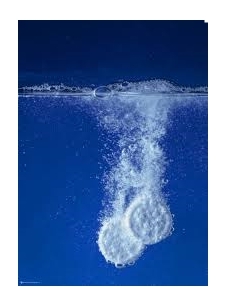 Color : White Tablet 5 G.
Release chlorine only when dissolved in water. Tablet is in a stable form. Easy handling & compact storage: No leaks or spillage. Bacterial Spores, fungi, algae, viruses etc. Less corrosive to rubber and stainless steel. Yields known level of available chlorine. Cleaning Operation Theater, emergency wards, surgical wards washing of hands, gloves & other daily use articles, sterilizing of cloths uses by hospitals. Disinfection of water prevention of diseases like diarrhea, cholera, typhoid, jaundice, gastro which predominantly spread through water contamination & is associated with high mortality rate.